In this 2004 photograph, University of Delaware researcher Kathleen Brewer-Smyth stands outside the Mid-Atlantic area prison where she conducted scores of interviews. 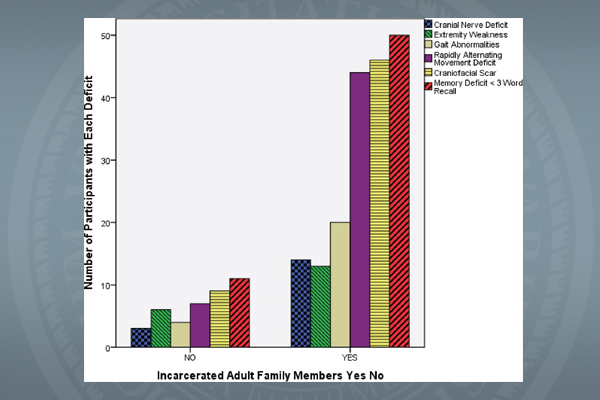 This table shows the contrast in neurological deficits between those who had no incarcerated adult family members during childhood and those who did. 9:44 a.m., April 18, 2016--A secondary analysis of data gathered in scores of interviews with female inmates suggests girls who have an incarcerated adult in the family may be at greater risk for lifelong neurological problems. 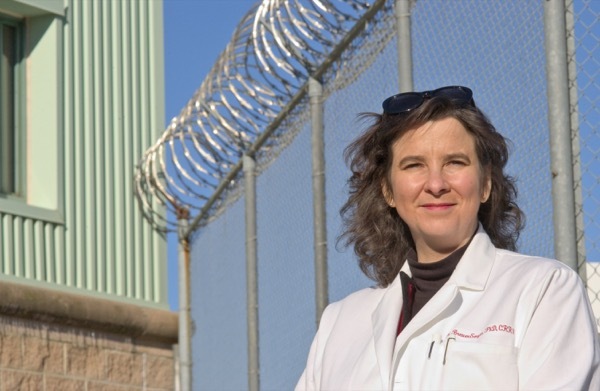 The new findings in a study by Kathleen Brewer-Smyth of the University of Delaware's College of Health Sciences show that female inmates with at least one adult incarcerated family member during childhood were more than twice as likely to have neurological abnormalities as adults than female inmates who had no incarcerated family members. The article was published by Health Care for Women International. The implications are significant internationally, Brewer-Smyth said, in light of a World Health Organization 2015 report that predicts neurological decline will be an increasing public health problem worldwide. Because of the nature of the study – a cross-sectional review of data gathered in other research – no cause and effect can be determined, said Brewer-Smyth, associate professor in the School of Nursing. However, knowledge of the many challenges and potential deficits facing children with an adult family member behind bars can help researchers, child advocates, and policy makers find better strategies and support systems for those children in the future. "We're good at identifying problems," Brewer-Smyth said, "but we haven't figured out the best ways to fix them." Brewer-Smyth's original research looked at neurological function and high-risk behaviors of female inmates. She has studied more than 770 prison inmates and conducted private interviews and examinations of 135 female inmates in a Mid-Atlantic-area prison, spending hours alone with many of them, often in maximum-security areas. The inmate interviews, conducted between 2000-07, represent an intense period of study that provided insight into the difficulties many had faced as children. With her background in neurological rehabilitation nursing, Brewer-Smyth found neurological incidents that predated the inmates' crimes and/or neurological abnormalities in 95 percent of the inmates. The incidents were primarily traumatic brain injuries. Additionally, some experienced exposure to lead or other toxins, stroke, seizures, central nervous system (CNS) infection, CNS tumor, having been the product of a complicated pregnancy and delivery, migraines, surviving cardio-pulmonary resuscitation, being struck by lightning, loss of consciousness such as due to choking, myasthenia gravis, and/or having undergone a neurosurgical procedure. “These conditions can lead to behavior and numerous other problems that can result in a prison sentence,” she said. The most common neurological deficits found were cranial nerve deficits, extremity weakness, gait abnormalities, rapidly alternating movement deficits, memory deficits, cranial facial scars, and palpable evidence of skull injury. She carried a concealed alarm with her when she interviewed inmates such as those who had been convicted of homicide. "As soon as she sat down, the first woman I interviewed who had committed homicide said, 'I didn't want to kill him. I just wanted him to stop hitting me,'" Brewer-Smyth recalled. "At that point when I could see obvious scars on her face, I forgot about the alarm and never needed to use it.... Everyone had a story. They didn't just get there. Something happened to them, mostly abuse during childhood." Inmates who had incarcerated adult family members while they were children also experienced greater physical and sexual abuse during childhood. Some inmates would tell Smyth-Brewer they had never been abused, but when she asked about scars and other signs of physical injury and asked other questions designed to assess symptoms of abuse, they would shrug and say, "Oh, yeah." "As if it was a normal part of life," she said. Often, she felt like she was in a behavioral health unit - not a correctional facility, she said. Signs of traumatic brain injury were common - some from repeated blows to the head, falls, accidents, and other violent encounters that occurred prior to the crime for which they were incarcerated. "But only two of 135 had had any kind of neuro-rehabilitation," she said. For some, the problems began when they were still in their mother's womb and were exposed to the illegal drugs she was taking, Smyth-Brewer said. Some were sexually abused by a boyfriend of their mother, were in and out of foster homes, and never knew who their father was. Those who knew their fathers sometimes had other horrors to navigate. "One woman told me, 'My father was good when he wasn't drinking, but when he was drinking he would get a gun out and start shooting,'" Brewer-Smyth said. "That little girl would run out and hide in the dog box with the dog. There, she was able to weather the storm." But that same little girl stopped going to school, ashamed of her bruises and the dog mess on her clothes after those incidents. "Without resources, that could have been any of us," she said. "I had a form of survivor guilt because I had full scholarships at the University of Pennsylvania, while she didn't have the resources to go to elementary school. I worry that any of us could be just one brain injury away from a prison sentence due to the very limited neurological rehabilitation resources for long-term follow-up after brain injuries." Brewer-Smyth is scheduled to speak on this problem at the ninth World Congress for NeuroRehabilitation in Philadelphia in May. Finding the best ways to interrupt what can become inter-generational cycles of physical and emotional trauma, neurological deficits and lifelong neurological impairment is critical, Brewer-Smyth said. Prison health systems, mental health workers, other health care providers, educators and child advocates all could contribute important support to help females recover and avoid further decline. Brewer-Smyth's co-authors include UD biostatistician Ryan Pohlig and Dr. Gabriel Bucurescu, a neurologist with the Veterans Affairs Medical Center in Philadelphia, who validated the neurological examinations.